It's chilly in Boston. Even though the sun is out, the icy breeze off the Charles River slices through the layers and chills the bones. Inside the Boston Convention Centre it's a little warmer, but the arena is so large it's cavernous and the sounds dissipate into the metal trussing many feet above. 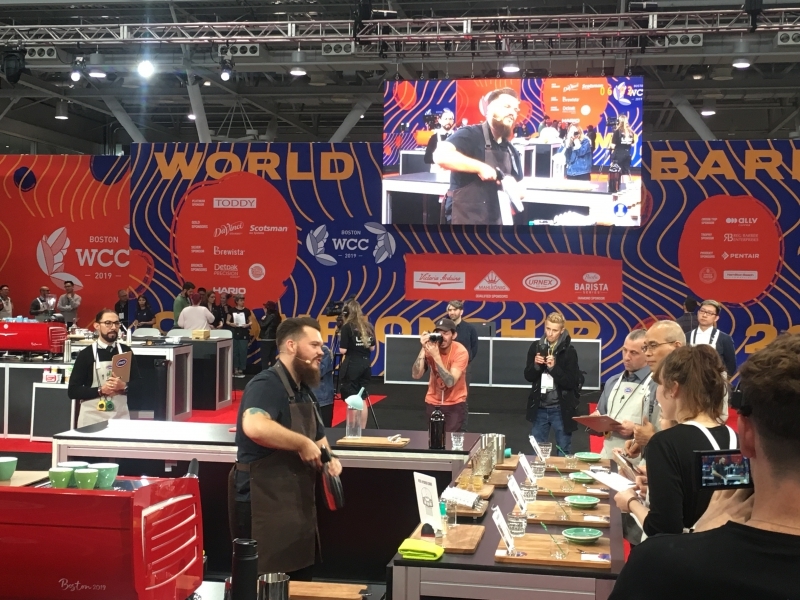 The WBC stage is enormous. There is a small group of us South African's at the side of the stage area. In fact, we're very close to Harry's station. 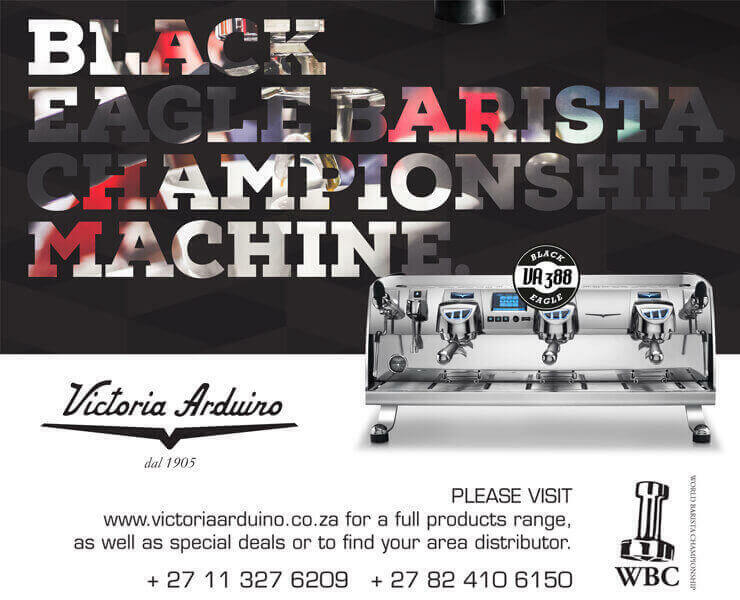 It's a booth set aside for the sponsors, but they are busy setting up their big stand in the Arena next door, so we sneak into it and we're literally a few metres away from the beautiful Fire-engine red Victoria Arduino Black Eagle. Harry wheels his trolley in, he chats with the floor staff. He sets up his stage quickly and efficiently. The competitor on the adjacent stage finishes his routine and the cheers ring out and drift up and away from us. Harry is ready. He's looking calm and very smart in his custom apron with typically Harry-like metal spikes on the back collar. Everything has come to this moment. The countless hours, the endless discussions over details. For this. Before any of us are even ready, the judges are on stage shaking Harry's hand and his set has begun. We've heard the set before, it's similar to Nationals back home with a few little tweaks. He starts with the introduction and is soon onto the Signature drink. Harry sounds clear, confident and deliberate in his practised movements. Everything is going to plan. His station setup is very impressive - the custom made boards, the rose-hydrofloral illustration and the deliberate placement of every little item. We clap, cheer and whistle loudly as he moves onto the milk-based course. The shots pull beautifully. John Evans has been Harry's coach and travelling partner for the past 6 weeks. "He's right on time" John tells me. We can't see the clock because its facing Harry and the Big screen has switched to the next competitors set. 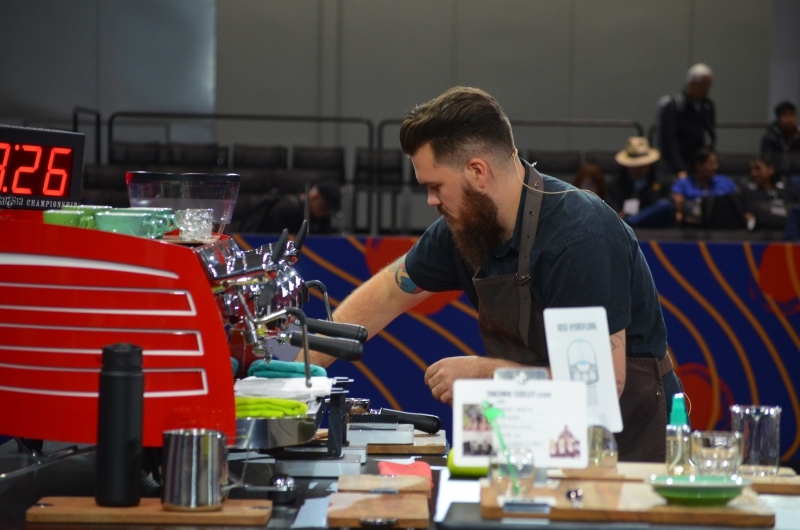 Harry pulls the espresso's and talks the judges through the drinking instructions. It's hard to tell what the poker-faced judges think. The shots look amazing. Harry looks pleased. He glances at the clock. Harry's closing remarks are heartfelt and earnest, but in reality goes a bit longer than he anticipates. "Time!" He calls suddenly. 27 seconds over time. The WBC has scrapped live scoring this year which we think is a good decision. 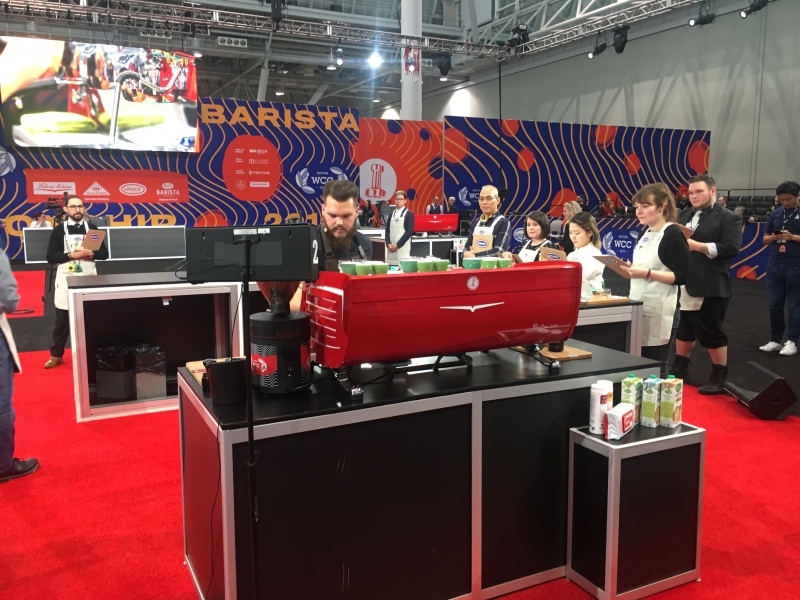 It keeps the baristas involved until the end of the first round, only releasing the top 5 scores for Espresso, milk and signature as a clue to who is leading, but Harry (and the rest of us) will only know if Harry has made the top 16 tomorrow evening. There is still the Team Brewbar Wild card, and we are certainly not ruling our Harry's chances of a semi-final just yet. It's a big stage, a big ask and Harry put in an enormous effort. Only time will tell if he's done enough! Harry prepares his signature drink for the 4 sensory judges. The clock ticks away the seconds as each barista executes their routine. Harry pours milk from Thatcher Farm, a local Massachusetts dairy which uses Holstein cows, the same breed as in SA which Harry has been practising with. Coach, John Evans looks on. The Biggest stage of all!